Just a few months ago a significant portion of villagers in Choratan didn’t have decent and reliable access to safe drinking water. Residents of this small town, which is nestled in the Berd Region of Tavush Province, had to walk several hundred meters to the nearest tap anytime they needed to collect water before carrying it back to their homes in buckets and cans. Villagers from Choratan finally decided to come together to solve the problem, and now the 50 out of its 150 resident families previously without their own water supply no longer have to leave their homes to get it. The team of villagers pinpointed a potable water source with potential capacity to serve the families in need about 2.5 kilometers outside of Choratan. Villagers discussed the issue with the mayor before speaking with staff from FAR’s Berd office who implement the Breaking the Cycle of Poverty Program. Villagers calculated that even if they were to design and build a water system on their own, they didn’t have money for the materials in Choratan’s budget. “About 10 people from the village participated in the work on a regular basis. Others helped us between one to two hours a day, as they were able. Everybody contributed to the effort to construct the new water system and make it work,” said project engineer Vardan Sahakyan. Now, these 50 families have easy access to potable water. Plus, many others express pride in the fact that they were able to collaborate and find a solution. This year FAR will support the construction and rehabilitation of drinking water systems in the villages of Artsvaberd, Aygedzor, Chinchin and Norashen, Eric said. 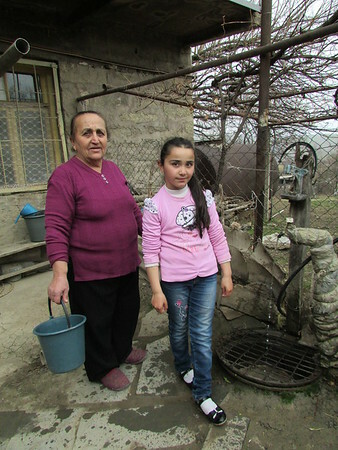 During 2015, support from BCPP enabled construction and rehabilitation of drinking water systems in Tavush and Chinari villages as well.